Gunta Ponganalu , is very delicious and authentic dish of Andhra. It is known as the “Appey” in Marathi and “Paniyaram” in Tamil. This is a very delicious and tasty way of completing the left out Dosa batter.You need special pan (Gunta ponganalu pan / Paniyaram pan) to make it. 1) Add the chopped onion, chillies, presoaked channa dal ,finely chopped coriander leaves , turmeric and sufficient salt to the dosa batter. Mix it well. 2) Heat the Gunta ponganalu pan / Paniyaram pan, brush with little oil and add sufficient batter in all holes. 3)You can add oil to the top if required. 4)Put lid on top of it. Put flame in medium heat. 5)Gently lift Ponganalu with Ponganalu lifter or with spoons. If properly cooked they should come out easily without sticking to the pan. 6)After sometime turn them upside down in the pan and wait until they turn golden brown color..
7)Check whether the batter is cooked inside. Once done remove them all to a plate. 8)Season the pan with oil, again repeat the steps to cook another batch . 9)Serve hot with coconut chutney. Looks so yumm, wish i hd one of those pans, in my next trip to India i am sure going to buy one. Looks like it is after long you are blogging. Fine dear.. welcome Back. How is ur Daughter?? where r u now?? Nice entry Sireesha.. looks perfect & yummy.. I don't have this pan here, otherwise I want to try this so badly. Mommy makes it for evenning dinner! :) Yours looks fluffy and in good color. Welcome back Sireesha, Hope u are well settled now and how are u & ur family? , glad to see with a delicious dish..Am doing well, missed ur delicious recipes.. Welcome back sireesha! Hope u are doing good! This makes a gr8 snack and looks delicious! hey sireesha..nice to c u after long time...hope u have well settled in ur place..anyways happy that ur back..and u have came up with fav appey..looks cute and yummy..
1st timer to ur blog,u have great collection. Punugulu looks awesome! My favorite..
How are you dear Sireesha? Welcome back! Glad to see u back after a long time, hope u re doing good! Delicious appey Sireecha! Nice to see you back Sireesha.. hope you've settled down well. 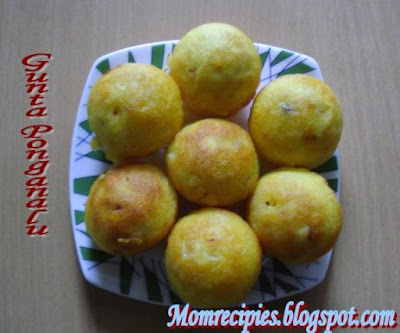 I love ponganalu/paniyaram too - cute & tasty. Am fine Sireesha How r u doing? Paniyaram looks great! I like this a lot. Great snack! easy and very tasty! nice snack. i am fine sireesha... how r u? long time. why no blogging? i have this pan,..got introduced to this pan in blogworld,..;-) hve tried makin kota,meatball,bhori and lotz of other stuff,..its been long time ,..where were u,..:? Hi Sireesha, I love this. Mostly had it in Hyderabad at snack outlets:-) Welcome back! Hope you have settled down. I love paniyaarams, it's been years since I ate them, delicious one! I'm gud.. nice to see ur comment after a long time..
Love appey.. miss it here a lot !! Heey Sireesha! Haven't "seen" you in a long time! How have you been? Were you not moving to a differet place? The gunta ponagalu look great! Hi Sireesha, appey looks delicious. why don't u send these to my cfk event. Nice to see u back. How are you? Where are you now?